Contact us for get discount price. Compact, two-way powered monitor system. 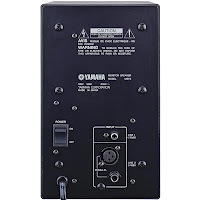 Balanced XLR, balanced phone jack and unbalanced RCA jack inputs for versatile connectivity. High and Low tone controls for sound tailoring. Separate Line 1 and Line 2 level controls. Waveguide technology delivers broad, uniform dispersion of high frequencies for optimum. Mic stand mountable with optional BMS10A Mic Stand Adapter. One feature you’ll love about Auro D412 is its conveniently lightweight, yet resilient design. The unit provides two oversized ergonomic carry handles, making transportation a breeze, while the solid polypropylene construction ensures roadworthy durability. Auro D412 is ideal for sound professionals and performers seeking to bridge the gap between portable and fixed installation applications. Auro D412 was designed to provide clear, full-range live sound reinforcement in a variety of applications. Whether you're a karaoke diva, singer/songwriter, DJ, or full band gigging in a medium-sized performance space, Auro D412 guarantees you an immensely powerful, sonically pure and highly mobile sound. In addition, the speaker enclosure’s floor monitor positioning angles lends Auro D412 perfectly to near-field and far-field monitoring applications. Beyond producing impeccable sound reinforcement, Auro D412’s elements of portability make it ideal for countless recreational uses. For a traveling instructor, Auro D412 is perfect for leading large exercise/yoga classes in fitness clubs. Outdoor functions pose no problem whatsoever for Auro D412. Block parties, sporting events, and matters of crowd control now have a more practical, and still extremely portable, alternative to the megaphone. 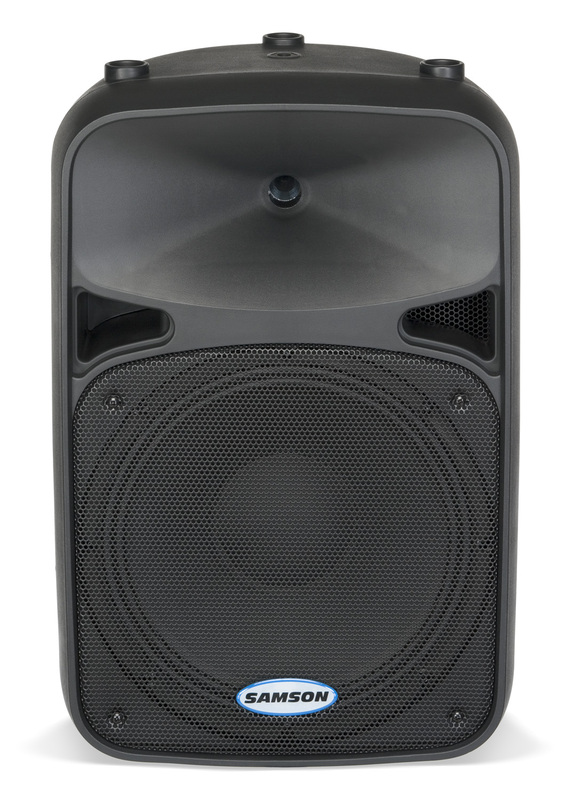 Auro D412 is also sure to excite the tailgating crowd, now able to demonstrate their team spirit at a level never before possible, or simply provide musical entertainment for a classic tailgate party. Click here to watch the Samson Auro D412/D415 Product Video! A Handheld PA System for On-the-Go Audio. Samson's Expedition 25i Portable PA makes public address more mobile than ever before. 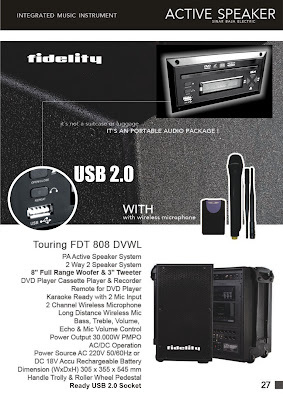 This versatile loudspeaker/push-to-talk microphone system provides power and performance in a highly portable package. A combination of ergonomic design and all-inclusive features allow the Expedition 25i to perform anywhere you need to address a crowd. Beginning with its lightweight and conveniently designed enclosure, which includes a carry handle, shoulder strap, mic stand adapter and internal rechargeable battery, Expedition 25i (XP25i) provides all-in-one audio. 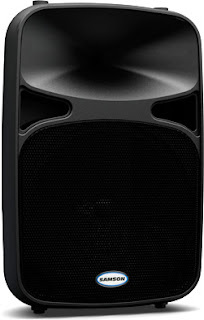 Controlled by a push-to-talk microphone, XP25i features a 5-inch full-range loudspeaker with 25 watts of RMS power. The unit offers additional versatility by including 1/8-inch line in/outputs, 1/4-inch mic inputs, aux inputs and a built-in iPod dock with level control so you can play your favorite tunes. These high-quality components and exceptionally rugged construction ensure a long life for your XP25i. This handheld PA delivers your message in a variety of situations. 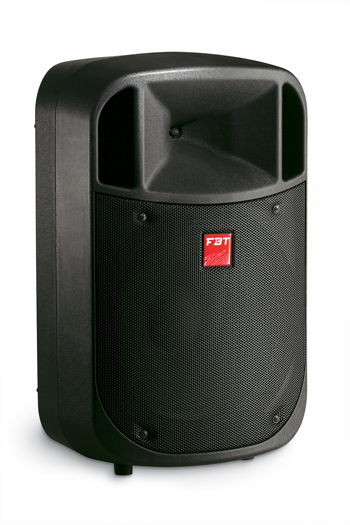 From business meetings, classroom activities and guided tours to crowd control, sports coaching and tailgating parties, XP25i is the perfect PA solution. Grab the attention of your colleagues and classmates with the XP25i. The system is great for hands-on presentations and demonstrations in both professional and educational settings. The XP25i’s portable design enables professionals to display and test consumer products in public forums, as well as direct their storage and maintenance in warehouses. Also, use the XP25i in the classroom to deliver a lecture or out in the field to power an interactive learning experience. In both cases, the use of prerecorded materials is possible via the XP25i’s iPod docking capabilities. Matters of crowd control now have a more resourceful alternative to the megaphone. The XP25i’s rugged, lightweight design is ideal for getting vital information to the masses in such on-the-go situations as guided tours, concerts, sporting events, in-store functions, and traffic direction. In addition, the XP25i’s internal iPod dock can easily amplify and broadcast any prerecorded audio like public service announcements to the crowd. Sports coaching is another way in which the XP25i has revolutionized the conventional megaphone. Whether your using it to run team workouts and practices, analyze video of previous matches at team meetings, or pumping up players before a game by blasting their favorite music through the loudspeaker via iPod, the XP25i brings the voice of a coach to a whole new amplitude. Also, demonstrate your team spirit at a level never before possible, or simply provide musical entertainment for a classic tailgate party with the XP25i. Samson’s Expedition 25i Portable PA: A handheld PA system for on-the-go audio. Fidelity FDT-808 DVWL-USB sangat praktis dalam pengoperasian & dapat digunakan untuk karaoke. 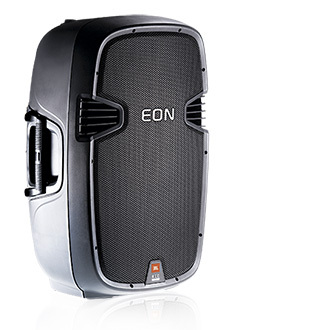 Samson introduces their most versatile and inclusive PA system to date: The Expedition 510i. Adopting the same principles of portability and simplicity that made Samson’s Expedition 308i so popular, the Expedition 510i (XP510i) is an all-in-one portable PA system that offers outstanding power and convenience. The pro-level performance of the XP510i begins with a pair of dual 2-way speakers with 10-inch woofers, complemented by a 1-inch titanium tweeter in a 60° x 90° horn. 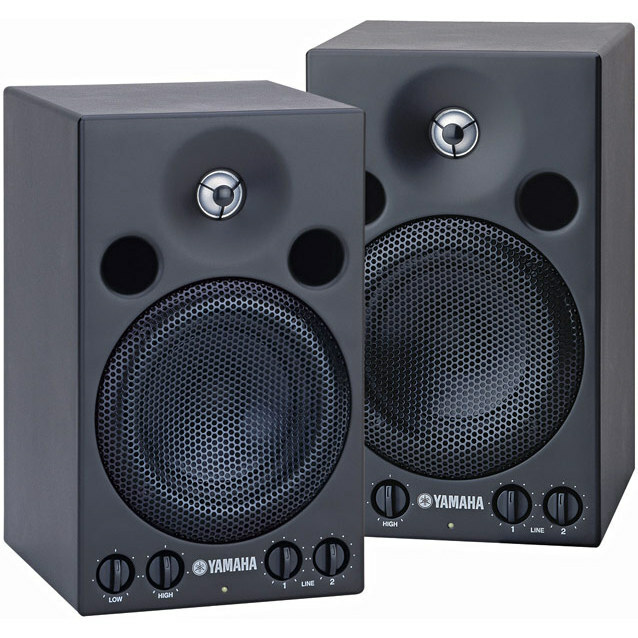 These speakers will provide dynamic low-end qualities and broad dispersion in any performance space. The XP510i features an internal 500 watt Class D powered mixer equipped with seven total mic/line and stereo inputs, phantom power, an integrated iPod dock, and ten studio-quality 24-bit digital effects to shape a customized sound for each and every performance. In addition, the speakers, mixer, and integrated 1 3/8-inch speaker stand mounts can be transported as a single compact bundle that weighs just over 50 pounds. 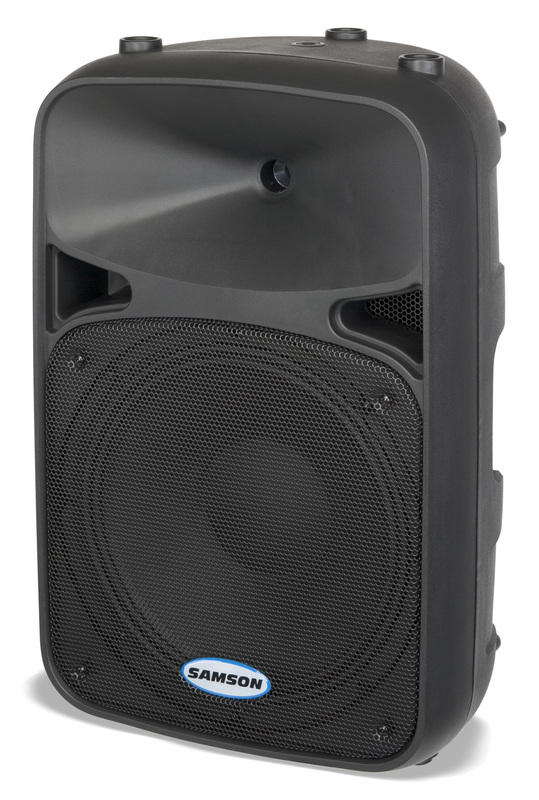 Thanks to its clever design and comprehensive feature set, the XP510i Portable PA offers an ideal solution for a variety of PA applications. Though the XP510i was designed for providing quality sound reinforcement in musical settings, the dynamic range of musical settings that can benefit from the system’s features is unparalleled. Whether you're a singer/songwriter gigging in a small coffee shop, a full band practicing in a medium-sized rehearsal space, or a DJ entertaining 500 people at a large club, the XP510i will ensure your sound is well suited for your space. 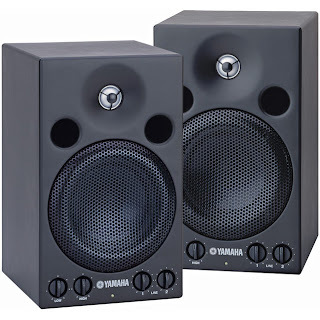 In addition, the system’s speaker enclosures lend themselves perfectly to a variety of musical performances when being used as floor monitors. With the XP510i, your voice will command the boardroom podium with as much authority as the main stage. The XP510i provides the perfect solution for a business professional leading any sort of presentation. No matter the application (PowerPoint presentations, company meetings, corporate events, etc. ), the unit will allow you to convey your ideas in a clear, concise manor and perform your job better. Specifically relevant in such cases, the XP510i’s integrated iPod dock enables your MP3 player to playback audio clips in promoting a more interactive listening experience for any audience. 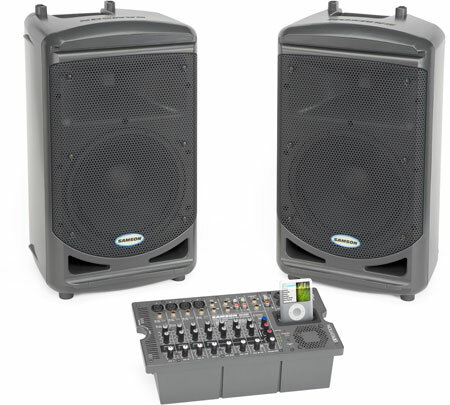 In addition to all students, teachers and professors utilizing the XP510i in some of the same circumstances as business professionals (presentations, audio playback), the system possesses some functions unique to music education. The unit is ideal for directing large instrumental ensembles. The XP510i will help conductors keep even their percussionists on task. Thanks to it’s integrated iPod dock, soloists and small ensembles can practice along with recorded accompaniment. Also, the XP510i’s audio playback abilities make the analysis of recorded music easier, as well as a more interactive listening and educational experience. Beyond producing impeccable public announcement sound quality, the XP510i’s elements of portability make it ideal for countless recreational uses. For a traveling instructor, the XP510i is perfect for leading exercise/yoga classes in fitness clubs. Outdoor functions pose no problem whatsoever for the XP510i. Block parties, sporting events, and matters of crowd control now have a more practical, and still extremely portable, alternative to the megaphone. The XP510i is also sure to excite the tailgating crowd, now able to demonstrate their team spirit at a level never before possible, or simply provide musical entertainment for a classic tailgate party. Embark on the all-inclusive PA expedition of a lifetime with the Expedition 510i. · Control panel with: Ground-lift switch, Combo XLR/jack inputs, XLR male output, limiter, Volume control. Ease of transport is a must. Amico’s large-diameter wheels and single carrying handle ensure maximum portability. A compact, lightweight cabinet with two safety panels ensures maximum protection for your gear and a stress-free life on the road. Featuring FBT’s renowned high quality components (including PWM amplifiers and neodymium loudspeakers) Amico delivers maximum power with flawless reliability. 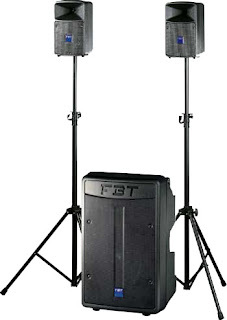 Ideal for live bands, solo performers, mobile DJs, entertainers, fitness trainers, sales presentations and conference organisers. Advanced gas injection-moulded polypropylene cabinets mean ultra-light weight combined with exceptional strength. Entirely integrated ready-wired system - the perfect “Plug and Play” solution. 15” bass reflex, high excursion sub-woofer with neodymium magnet assembly. Trolley-style transport, with scuff-proof 100mm Æ plastic wheels means no marked venue floors! Fully-integrated mixer with newly developed digital effects processor offering 256 presets.